Rusbase, an independent website devoted to technology, business and investment, published a list on Tuesday of the top five most interesting biotech startups in Russia, and all are residents of the Skolkovo Foundation. 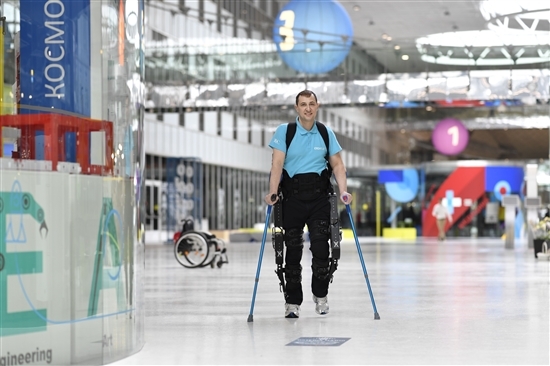 An ExoAtlet pilot demonstrates the medical rehabilitation exoskeleton in the Skolkovo Technopark. Photo: Sk.ru. ExoAtlet makes robotic exoskeletons that enable people who have lost the use of their legs to stand up, sit down, walk and go up and down stairs. In addition to helping people recover their mobility, regular training in an exoskeleton has been shown to improve the patient’s muscle tone and a range of other heath factors, as well as their self-confidence and overall wellbeing. ExoAtlet won the main prize at Skolkovo’s Startup Village in 2014 and became a resident of the foundation soon afterwards. The company launched sales of its exoskeletons in 2016, having conducted clinical trials and obtained a medical license for the product. In April this year, it raised investment of $5 million from Korea’s Cosmo and Company to expand its business to Europe, China and the U.S. The Korean company previously funded ExoAtlet’s development in Asia. 3D Smile is a system for straightening teeth without braces. A 3D scan is made of the patient’s teeth and a plan devised for straightening them, and then based on the scan, a series of personalized mouth guards is made using a 3D printer. The patient wears each mouth guard for two weeks before progressing to the next one, while checking back in with the dentist every two months. 3D Smile's system on show at the Open Innovations Forum at the Skolkovo Technopark in 2017. Photo: Sk.ru. The system has been on sale in Russia since 2014, after obtaining certification from the Russian health authorities, and its turnover in 2016 was 35.5 million rubles, according to Rusbase. Knomics has devised a home test for analysing the makeup of a person’s microbiome. A growing area of scientific research suggests that biomarkers in our guts could help doctors identify which patients will respond to which drugs better, and also make dietary recommendations to patients that would help to prevent the onset of diseases such as diabetes, obesity and cancer altogether. Knomics is working on helping people to adjust the balance of bacteria in their guts to keep them as healthy as possible. Dmitry Alexeev, CEO of Knomics, which is devoted to studying the makeup of microbiomes. Photo: Sk.ru. The company, which works from a lab inside the Skolkovo Technopark, won the third prize at the Pioneers Moscow competition to discover the best budding tech companies in 2016. Neurochat helps people who have both speech and movement disorders, such as those who have suffered a severe stroke, to communicate with other people using a brain-computer interface. The user wears a headset that registers the electrical activity of the brain and transmits data to the user’s computer via Bluetooth. The system transforms the patient’s mental effort into specific commands for the computer keyboard, enabling people to type text without using their voice or other movements. It can also be used to control household appliances, adjust beds etc., and for users to interact with each other remotely in a brand new kind of social network for people in similar situations. The company says it takes just 12 minutes to master the system. The company was recently named one of the 100 best inventions of Russia by Rospatent, the federal intellectual property service. The DRD team present prototypes of their tests for detecting brain damage and concussion. Photo: Sk.ru. DRD Biotech has designed an express test that can diagnose strokes and other forms of brain damage in just a few minutes from a single drop of blood. The test can not only determine whether a patient has had a stroke, it also shows whether they are at near-term risk of suffering one. It can also be used to detect concussion and the risk of posttraumatic epilepsy. 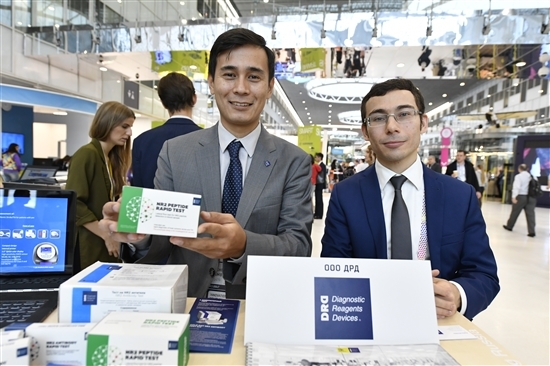 DRD, which also works from its own lab at the Skolkovo Technopark, won a Skolkovo grant that it used to develop a prototype test and to partially cover the cost of clinical trials. The company expects to obtain a license for its tests in Russia this year, and when the product reaches the market, it is expected to cost no more than $20.